Stray Voltage | Mothers Against Wind Turbines Inc.
Now be honest: Would you buy this home? Is Dirty Power Killing Us? Saturday afternoon over ninety members of the public attended an electrifying community information session on “Understanding Stray Voltage and Industrial Wind Turbines” held at Covenant Christian School in Smithville. The keynote speaker was Mr. David Stetzer an electrician with 30 years’ experience. Stetzer specializes in power control in industry, municipalities, and motor control centers. For the last decade, Stetzer has focused his attention on power quality analysis and troubleshooting. He is a senior member of the IEEE (Institute of Electrical & Electronic Engineers), an expert witness in litigation suits in ground currents and power quality, co-author of peer reviewed papers in journals as well as a producer of the documentary ‘Beyond Coincidence: The Perils of Electrical Pollution’. Stetzer attributes much of the dirty electricity – frequently referred to as ‘stray voltage’ that exists in Ontario – to the overloading of the single return wire in our power supply. Eighty percent of the power that returns to the substation is “dumped” onto the ground. We do not see, hear, feel, taste or smell electromagnetic energy. Yet the proliferation of electrical pollution creates problems for people who have a biological reaction to the poor power quality that is generated by industrial wind turbines, power transmission lines and distribution lines. 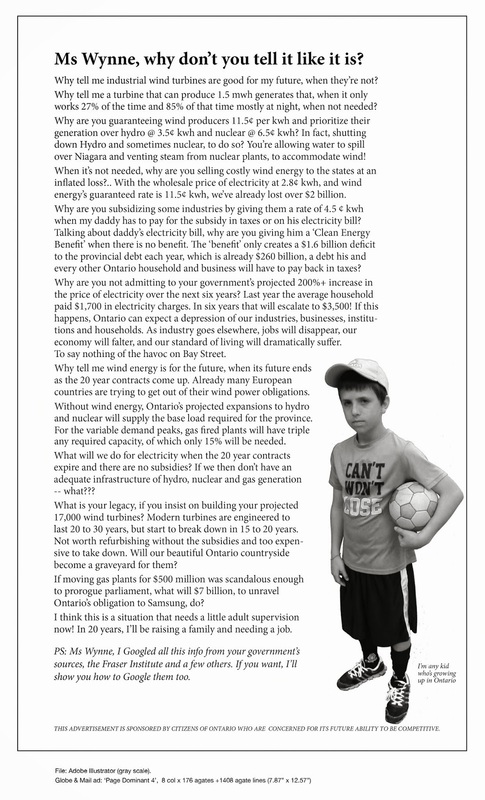 Any power generator in Ontario has an obligation to transmit ‘clean power’. Using an oscilloscope, it is possible to measure the pure sine wave of clean power and determine what harmonics, transients or intermediate frequencies which produce poor power quality or ‘dirty electricity’ are also present. Tuned filters at the site of power generation prevent some of the distortion. But according to Stetzer the best solutions are to enforce current and existing codes and standards like the IEE519. Stop using the earth as a return circuit for the neutral current, by increasing the size of the utility’s Primary Neutral or utilize a 5-wire system to accommodate power returning to the substation. Much of Stetzer’s work has been done with dairy cows to identify causes of decreased milk production. Poor production costs time, money and health. As one member of the audience pointed out – industrial wind turbines are an intermittent power generator and only produce 28% of the nameplate capacity. “It’s like buying a one-titted cow” she said. The second speaker was Carmen Krogh – a full time volunteer and published researcher regarding health effects and industrial wind energy facilities. She shared her preliminary research on why people in communities with industrial wind turbine generators leave their homes. Community members were invited to participate in a community-based study to explore the circumstances which may influence individuals and families to vacate or remain in their home when living near a wind energy project. Participation was voluntary, and 67 community members shared their experiences. Based on preliminary results, sleep disturbance appears to be the most common reason people vacate. Other symptoms included: sensations such as pressure in the ears, chest, head, heart, bladder: ear problems such as tinnitus, burning, popping in ears; heart palpitations such as racing heart, increased blood pressure; headaches such as, migraines, stomach aches; nausea, vomiting, dizzy, vertigo; nose bleeds, skin infections, stress, anxiety, extreme agitation/ irritability, depression, cognitive, loss of concentration, and a sense of panic. Krogh’s next steps are to finalize her data analysis and submit a number of papers for publication in peer reviewed journals. In addition, these findings will be shared with government authorities both domestically and globally. Barb Ashbee – a member of the panel discussion – provided the victim impact perspective. Ashbee and her husband were happy, healthy involved community members before a wind turbine project started up near their home. The serious adverse health effects drove them out of their community. Testing in their home showed out of compliance noise, infrasound and electrical pollution. It was a battle to get any meaningful information or assistance from the government. After hiring a lawyer, they settled with the company, were able to relocate and their symptoms subsided after moving. Almost 10 years later, the anger and dismay at what the government is doing to citizens has not lessened as the toll rises. Ashbee continues to advocate for resolution for victims impacted by wind energy. The supper speaker was Mr. Alan J Whiteley, an attorney for over 30 years. He has negotiated government defense contracts and served as counsel for the arbitration of international commercial disputes. Whiteley is legal counsel for the County Coalition for Safe and Appropriate Green Energy (CCSAGE) based in Prince Edward County, and is challenging various aspects of Ontario’s Green Energy Act via a Judicial Review. According to Mr Whiteley, the Green Energy Act (GEA) has harmed the health of rural residents, the sustainability of the natural environment, water quality, local economies, rural roads, property values, municipal assessment taxes, heritage properties and the safety of residents and communities. The implementation of the GEA is biased in favour of proponents of renewable energy projects and against individuals, communities and municipalities. In many cases the Ministries improperly delegate their statutory powers to others, and continually grant consent to renewable energy projects without any cost/benefit analysis. Industrial wind facilities must be placed in rural agricultural areas of Ontario and the result has been an industrialization of rural Ontario. Unwilling host municipalities and their residents can not exercise sound planning principles with respect to industrial uses of land within their jurisdiction. The Fire Protection and Prevention Act was changed to prohibit owners of abutting lands from claims for damages caused by fires originating from renewable energy projects. The Assessment Act, deems the assessed value of a $2.2 million wind turbine tower at only 4.6% of the current value of the industrial wind turbine. This discrimination violates section 15 of the Canadian Charter of Rights, which guarantees equal protection and equal benefit of the law to all Canadians. The GEA contravenes several international conventions to which Canada is a party, including the Universal Declaration of Human Rights, and the Rio Declaration on Environment and Development. According to Whiteley, the Canadian legal system faces an access to justice crisis. The Supreme Court of Canada has stated that there must be practical and effective ways to challenge the legality of state action. However, ordinary citizens have unequal access to costly justice that wealth can provide. Huge corporations can bully and manipulate the law in their own interests while ordinary citizens lack the means to begin a legal proceeding. If the traditional cost rules of the justice system are revised, citizens will regain their right to challenge government action. The day provided information on issues that affects us all – dirty power and limited access to legal justice. Dine-With-Us Option: A full course, pay-per-plate offering is available for the evening portion of this event. Alan Whiteley will be our featured speaker. Dinner Includes: Salad, Chicken (pancetta cream sauce), roasted potatoes, vegetables, dessert and tea/coffee. Please email strayvoltagedinner@gmail.com or 905-562-7159 (Mary) to confirm your attendance for the Dine-With-Us paid dinner event. David Stetzer: IWT Fingerprint, Tuned Filters, IEEE Standards & Regulations, Hydro Regulations, How Stray Voltage Affects Us All. Dine-With-Us Option: A full course, pay-per-plate offering is available for the evening portion of this event. Lawyer Alan Whiteley will be our featured speaker. Dave Stetzer has been an electrician by training, education and experience for over 30 years. In 1975, Dave founded Stetzer Electric, Inc. and remains the president of the company to this day. Since the firm’s inception, Dave has specialized in power control in industry, municipalities, and motor control centers. For more than the past decade, Dave has focused more attention on power quality analysis and troubleshooting, which led to the founding of Stetzer Consulting. Dave Stetzer is a senior member of the IEEE (Institute of Electrical & Electrical Engineers), an expert witness in litigation suits in ground currents and power quality, co-author of peer reviewed papers in journals, producer of the documentary ‘Beyond Coincidence: The Perils of Electrical Pollution’, consultant for Ministers of Health in Kazakhstan, Middle East and Government Health Officials in Russia. He continues to be a sought after, integral contributor in research projects around the world. Carmen M Krogh is a full time volunteer and published researcher regarding health effects and industrial wind energy facilities. She shares information with communities; individuals; federal, provincial and public health authorities, wind energy developers; the industry; and others. An author and a co-author of peer reviewed articles and conference papers presented at wind turbine noise scientific conferences. A retired pharmacist whose career includes: senior executive positions at a teaching hospital (Director of Pharmacy); a drug information researcher at another teaching hospital; a Director of a professional organization; a Consultant at the Bureau of Human Prescription Drugs (Health Canada); and a Director (A) at Health Canada (PMRA). She is the former Director of Publications and Editor in Chief of the Compendium of Pharmaceuticals and Specialties (CPS), the book used by physicians, nurses, and health professionals for prescribing information in Canada. Alan J Whiteley has been an attorney for over 30 years, is accredited by the Upper Canada Law Society, and has a consistently high rating with the Martindale-Hubbell Register of Preeminent Lawyers. He has been the Editor of University of Toronto Faculty of Law Review, negotiated government defence contracts, and served as counsel to the Security Intelligence Review Committee (Canada). His experience includes serving as counsel for the arbitration of international commercial disputes as well as having served as counsel for internationally-based aerospace and airport organizations. He is legal counsel for the County Coalition for Safe and Appropriate Green Energy (CCSAGE) based in Prince Edward County, and in this capacity has undertaken to challenge various aspects of Ontario’s Green Energy Act via a Judicial Review. Mr Whiteley will be participating on the panel discussion and offering observations on the hurdles to be overcome to obtain legal remedy from experiencing negative effects of IWTs. Barb and her husband were happy and healthy before a wind turbine project started up around their home causing serious adverse health effects that drove them to leave. Testing in their home showed out of compliance noise, infrasound and electrical pollution. It was a battle to get any meaningful information or assistance from the government. After hiring a lawyer, they settled with the company, were able to relocate and their symptoms subsided after moving. Almost 10 years later, the anger and dismay at what the government is doing to citizens has not lessened as the toll rises. Barb continues to advocate for resolution for victims impacted by wind energy and has communicated with and attended countless government and community meetings over the years. While Dufferin Wind Power Inc. (DWPI) “unequivocally” states its transmission line meets all regulations, Melancthon Mayor Darren White wants the county to conduct its own electromagnetic field (EMF) tests. At county council’s meeting this Thursday (Jan. 8), White plans to urge politicians hire an electrical engineering consultant to determine whether the amount of stray energy being emitted from Dufferin Wind’s 230 kV transmission line is safe or not. Since Health Canada doesn’t consider EMF a hazard, there are no precautionary measures required when it relates to daily exposure. As such, Dufferin Wind spokesperson Connie Roberts noted the company has no testing guidelines to follow. “We state unequivocally that all protocol has been followed in the construction of this line,” Roberts explained in an email, claiming opponents to her company’s project are requesting EMF measurements that aren’t mandated in Canada. In an effort to address climate change, governments have pursued policies that seek to reduce greenhouse gases. alternative energy including wind power, has been proposed by some as the preferred approach. Few would debate the need to reduce air pollution, but the reduction is important not only for efficiency but also for health protection. The topic of adverse health effects is the environs of Industrial Wind Turbines (AHE/IWT) has proven to be controversial and can present physicians with challenges regarding the management of an exposure to IWT. Rural physicians in particular must be aware of the possibility of people presenting to their practices with a variety of sometimes confusing complainants. An earlier version of the diagnostic criteria for AHE/IWT was published in Aug 2011. A revised case definition and a model for a study to establish a confirmed diagnosis is proposed. Diagnostic criteria for adverse health effects in the everons of wind turbines.. Stray – or ‘tingle’ voltage – is a low-level electrical current or shock (typically under 10 volts) that results primarily from an improperly grounded or, in some cases an ungrounded, electrical distribution system. grounded in order to keep voltage potential differences between the neutral wire and the ground, below levels that could be considered harmful. While potential exists for stray voltage in residential areas, it is most commonly found at agricultural operations and is often attributed to poor grounding of the neutral wiring system in an environment where the presence of water increases conductivity between points of contact. The term ‘stray voltage’ is often misused due to poor understanding of its cause. Stray voltage has incorrectly been called ‘dirty electricity’, implying that some forms of electricity are better or cleaner than others. Electricity from all sources is equally ‘clean’. Stray voltage has also been confused with electricomagnetic fields (EMF), grounding systems or even naturally-occurring currentfound in the earth. potential – such as a metal dish filled with water and a wet concrete floor – creating a path for current (electricity) to flow through the animal. and water intake, or proving difficult to handle. All electrical current must be respected as potentially harmful and stray voltage, although present in low amounts, is no different. Based on research, levels below 1 V are considered to be inconsequential, and generally not believed to cause behavioral changes in farm animals. In most cases the source of stray voltage can be identified, allowing it to be either mitigated or eliminated. proper installation, wire condition and code compliance. An inspector will seek to isolate the source of neutral-to-earth (ground) voltage through measurement of voltage at various points within the electrical system. This helps to determine whether the issue is related to on-farm wiring and distribution or whether the issue is related to the electrical distribution system off the farm. As part of its two-year research and consultation process, the OEB employed Dr. Douglas J. Reinemann, a Professor of Biological Systems Engineering and a leading authority on stray voltage to review studies and literature on the subject. sensation or annoyance in farm animals”. He also further specifies the term as “a special case of voltage developed on the grounded neutral system of a farm”. There has been much confusion on the topic of stray voltage, and wind turbines have at times been inappropriately linked as direct sources of stray voltage. Stray voltage is a potential symptom in any system of electrical distribution, regardless of source and is especially prevalent on working farms. Wind turbines are often located in agricultural areas, connecting to the provincial electricity grid with farm operators leasing the land on which the turbines sit. Through improved regulation and electrical code enforcement, incidences of stray voltage will be increasingly detected and eliminated. Experiencing production challenges or caring for livestock with health problems is never easy on the farm. It’s even more difficult when farmers and veterinarians struggle to identify the source of the problem. Now, more Ontario farmers are becoming aware of an environmental challenge that has a significant impact on animal health – the issue of Also called “ground current” or “stray voltage,”Uncontrolled Electricity occurs when there is a constant underground electrical current flowing in the ground or barn. Animals can be exposed to shocks transmitted through barn floors, milking equipment and water bowls. Livestock exposed to uncontrolled electricity may have lower production, stop eating or drinking, or exhibit other odd behavior. Some cases even result in death. It’s important that Ontario farmers educate themselves on how to recognize the signs of ground current challenges on the farm. That’s why the Ontario Federation of Agriculture (OFA) is helping to raise awareness about uncontrolled electricity. We belong to a working group of agricultural organizations in Ontario that is looking to identify the severity of the problem, and work with utility companies to address the issue. The OFA has also launched a series of online videos to help raise awareness about issues such as uncontrolled electricity. OFA’s most recent video, Understanding Uncontrolled Electricity on the Farm, provides background information on the issue, and explains important steps farmers need to take to identify and fix the on-farm problem and where to find help. For farmers who suspect uncontrolled electricity is at play on their farm, their first phone call needs to be to a licensed electrician. The electrician should visit the farm to test for ground current, and work with the farmer to fix any problems that are within the farm’s electrical system. Uncontrolled electricity can also come from off–farm sources beyond a farmer’s control, such as the farm’s electricity carrier. If the licensed electrician discovers the problem is from an off-farm source, he or she will work with the farmer to contact the local utility to file a report. A utility representative needs to visit the farm to test for ground current. It is important that farmers document all reports of uncontrolled electricity, so that all parties are aware of the extent of the problem. The OFA is working with other agricultural organizations and Hydro One to address ground current challenges on Ontario farms. Gaining more control over this and other issues will go a long way in helping to enabling prosperous and sustainable farms. For more information check out our video on uncontrolled electricity – on our You tube Channel, OntarioFarms, or visit http://www.ofa.on.ca/ to learn more about this serious concern. People who live near wind turbines complain of symptoms that include some combination of the following: difficulty sleeping, fatigue, depression, irritability, aggressiveness, cognitive dysfunction, chest pain/pressure, headaches, joint pain, skin irritations, nausea, dizziness, tinnitus, and stress. These symptoms have been attributed to the pressure (sound) waves that wind turbines generate in the form of noise and infrasound. However, wind turbines also generate electromagnetic waves in the form of poor power quality (dirty electricity) and ground current, and these can adversely affect those who are electrically hypersensitive. Indeed, the symptoms mentioned above are consistent with electrohypersensitivity. Sensitivity to both sound and electromagnetic waves differs among individuals and may explain why not everyone in the same home experiences similar effects. Ways to mitigate the adverse health effects of wind turbines are presented. With growing concern about climate change, the carbon budget, depletion of fossil fuels, air pollution from dirty coal, radiation from nuclear power plants, and the need for a secure energy supply, more attention and funding are being diverted to renewable energy. Among the various types of renewable energy, wind has received a lot of attention due, in part, to opposition from communities earmarked for wind turbines and from communities that have experienced wind turbines firsthand. Some people who live near wind turbines report difficulty sleeping and various symptoms of ill health and attribute these problems to noise and shadow flicker—two elements they can perceive. Indeed the U.S. National Research Council (Risser et al., 2007) identify noise and shadow flicker as the two key impacts of wind turbines on human health and well-being. that while some people living near wind turbines report symptoms such as dizziness, headaches, and sleep disturbance, the scientific evidence available to date does not demonstrate a direct causal link between wind turbine noise and adverse health effects. the sound level sound level from wind turbines at common residential setbacks is not sufficient to cause hearing impairment or other direct health effects, although some people may find it annoying. Low frequency sound and infrasound from current generation upwind model turbines are well below the pressure sound levels at which known health effects occur. Further, there is no scientific evidence to date that vibration from low frequency wind turbine noise causes adverse health effects. The year-late report from the Municipal Property Assessment Corporation (MPAC) on the effect of wind turbines on Ontario property values is nothing more than a self-serving exercise by bureaucrats to serve their government masters, says Wind Concerns Ontario. The MPAC study also does not include properties that are listed for sale but never sell. “You can’t measure what didn’t happen,” Wilson adds. The purpose of the study was to justify MPAC’s refusal to add wind power developments as a factor in assessing property value, although the corporation does factor in other less desirable features such as quarries, garbage dumps and other industrial facilities. “Taxpayers paid for this study which will now doubtless be used by their own government against them, as they seek re-assessment of their properties, or even go to court for lost property value,” Wilson said.